2. Dharmakaya of Expediency (Hoben Hosshin), which is also called „Dharmakaya of Compassionate means”. The first is the ultimate, unconditioned reality beyond form, which is equally shared by all Buddhas, while the second is the specific and particular manifestation of each Buddha for the sake of saving sentient beings. What is the relation between the “Two Buddha bodies” as expressed by T’an-luan, and the “Three Buddha bodies” (Trikaya)? The Dharmakaya of Dharma-nature is identical with the Dharmakaya reffered to in the Trikaya doctrine, and the Dharmakaya of Expediency (Dharmakaya of Compassionate means) corresponds to the Sambhogakaya or Recompensed Body. Nirmanakaya or various Transformed Bodies are manifested/emanated from Sambhogakaya and thus, we can consider it as part of the Dharmakaya of Expediency. In the first two verses Amida is described as Dharmakaya of Expediency or Dharmakaya for the sake of sentient beings (Sambhogakaya), while in the last verses His ultimate formless Dharmakaya (Dharmakaya of Dharma-nature) is revealed. This ultimate aspect of Amida, or Amida as a Dharmakaya Buddha, is the essence and true nature of His transcendental manifestations, or Amida as Sambhogakaya Buddha. Thus, Amida as Dharmakaya is preceding Amida as a result of Bodhisattva Dharmakara's practices and vows (Amida as described in the Larger Sutra). Why do I say this? The reason is very simple – Amida as Dharmakaya is the same with Suchness, Nirvana or Buddha nature, which is always present (without beginning and without end) and not produced by anything, while Amida as Sambhogakaya, or Amida as Dharmakaya of Expediency, has a beginning in the moment Dharmakara fulfilled His practices and attained Enlightenment. “Supreme Nirvana is the uncreated dharma-body. Uncreated dharma-body is true reality. True reality is dharma-nature. Dharma nature is Suchness. Suchness is Oneness. Amida Tathagata comes forth from Suchness and manifests various bodies – fulfilled (Sambhogakaya/Dharmakaya of Expediency), accommodated and transformed”. So, when Dharmakara attained perfect Enlightenment/Nirvana/Suchness, He automatically became Amida Tathagata in two aspects: 1) Amida as Dharmakaya or ultimate reality beyond forms, with no beginning and no end (“Thus Gone”), and 2) Amida as Dharmakaya of Expediency or Sambhogakaya, that is Amida in Form and Name, dwelling in His Pure Land (“Thus Come”). Both are different aspects of the one and the same Amida Buddha, but again, if we ask ourselves, who was first, Amida as Dharmakaya or Amida as Sambhogakaya, we should answer – Amida as Dharmakaya. This is because, as I said above, the ultimate Dharmakaya is always present; it was present before Bodhisattva Dharmakara formulated the 48 vows and started the practices, before He attained Enlightenment and became Amida, and will always be present in the never ending future. 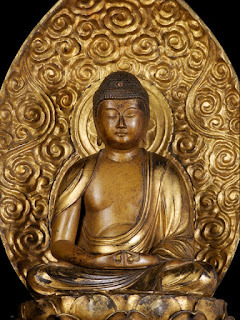 This is the logic of Shinran’s words, “He seems a Buddha more ancient than kalpas countless as particles” and of the Two Buddha Bodies Doctrine according to which Amida as Dharmakaya of Dharma-nature (Amida beyond form) is the origin and essence (the true nature) of Amida as Dharmakaya of Expediency (Amida in Form and Name/Amida in His Pure Land). Without Dharmakara becoming Amida in Sambhogakaya form (Dharmakaya of Expediency), Amida as Dharmakaya beyond form could not save anybody. So, we say as Master T’an-luan: “from the Dharmakaya of Dharma nature originates the Dharmakaya of Expediency”. Also, without Amida in His eternal aspect beyond form, there is no Amida in Form and Name, that is, Amida as the Reward of Dharmakara's practices and vows. This is because if Bodhisattva Dharmakara did not awaken himself to the Dharmakaya beyond form, He could not become Dharmakaya in Form and Name or Amida as described in the Larger Sutra, dwelling in His Pure Land. It is very important to understand that without perfect Enlightenment or Suchness (ultimate Dharmakaya) as its base and true nature, Amida in Form and Name and His Pure Land would be just another samsaric manifestation. This is why, Master T’an-luan used the term Dharmakaya for both the ultimate nature of Amida Buddha (Dharmakaya of Dharma-nature) and for His transcendent manifestations (Dharmakaya of Expediency) – because he wanted us to know that the last are firmly grounded in the ultimate, formless Dharmakaya. So, again, when Bodhisattva Dharmakara attained perfect Enlightenment, He awoke himself to the ever-existent and non-produced Dharmakaya beyond form. In that moment, and in accord with His 48 Vows, Amida in Form and Name and the Pure Land came into existence. The attainment of perfect Enlightenment or Awakening to ultimate Dharmakaya was the decisive factor who produced the Sambhogakaya (Dharmakaya of Expediency) aspect of Amida and His Pure Land. This again, is the logic of saying, “from the Dharmakaya of Dharma nature originates the Dharmakaya of Expediency”. From Awakening to the ever-present Dharmakaya/Suchness/Buddha-nature/Nirvana, and on the basis of this Awakening, originates the transcendent manifestations for the sake of saving sentient beings, which is Amida in Form and Name, and His Pure Land. In short, Amida as ultimate Dharmakaya is the „Buddha more ancient than kalpas countless as particles”, as Shinran said, and Amida in Sambhogakaya form or Amida as Dharmakaya of Expediency is His manifestation in accord with Dharmakara’s practices and vows. What the Larger Sutra shows to us, is the process through which Amida as ultimate Dharmakaya becomes Amida in Form and Name for the sake of saving sentient beings. This process was perfected ten kalpas ago, as Shakyamuni and Shinran Shonin explained, “ten kalpas have now passed since Amida attained Buddhahood”. All quotes in this chapter were taken from “Ojoronchu – T’an-luan’s Commentary on Vasubandhu’s Discourse on the Pure Land, A Study and Translation” by Hisao Inagaki, Nagata Bunshodo, Kyoto, 1998. T’an-luan said: „All Buddhas Tathagatas are called ‚equally enlightened ones’”. Master Shan-tao said: “All Buddhas have attained one and the same Enlightenment”. Also in the Garland Sutra, quoted by Shinran Shonin in his Kyogyoshinsho, it is said: “The bodies of all Buddhas are only one Dharma.body”. Sometimes the term is Thusness instead of Suchness. Both indicate the same ultimate reality. The Collected Works of Shinran, Shin Buddhism Translation Series, Jodo Shinshu Hongwanji-ha, Kyoto, 1997, p.153. „This Pure Land complies with the Dharma- nature and is not in conflict with the Dharma-base”. Wow Josho, That was super interesting. I think I shall read it a couple more times to really let it sink in as I can feel there is much much more for me to learn out of this post. Although my understanding of this is not complete at present, I can feel that this is a key piece for me once I do understand it fully. But it does make perfect sense to me that Dharmakaya in the ultimate aspect, came and comes first. Thank you for posting this, as it really will help me alot. Yes, Dharmakaya from the Trikaya is the same as Dharmakaya of Dharma nature from the two body doctrine, and Sambhokaya is the same as Dharmakaya of Expedient means or Dharmakaya for the sake of compassionate means. And Nirmanakaya is emanated by Sambhogakaya (Dharmakaya of Expedient means). In fact, there are many Nirmanakayas who come from a Sambhogakaya body of Amida. In the ultimate Dharmakaya sense, Amida is the same with all Buddhas. In the Sambhogakaya sense He is in the Pure land, and He is as described in the Larger Sutra, and in Nirmanakaya (transformed or accommodated body) sense, He is everywhere in all the places of Samsara, and He is right there with you now, protecting you! 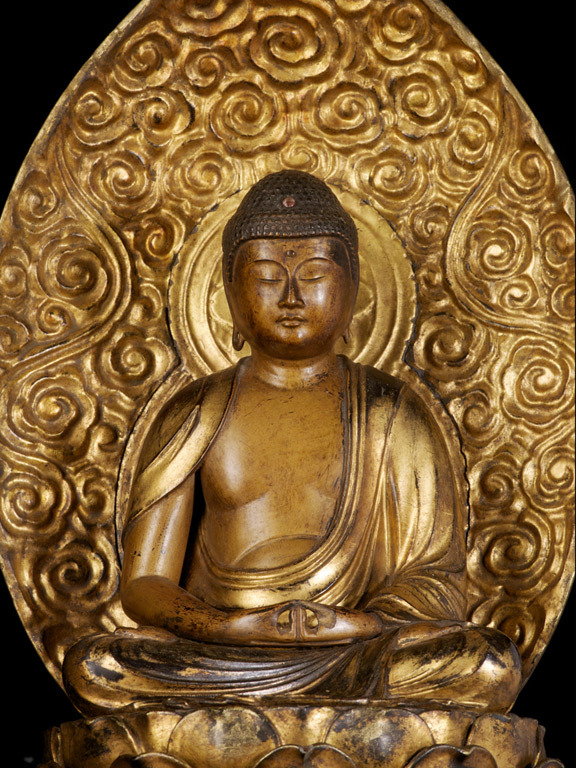 The aureole of Amida Buddha (that is, the aureole of Amida as Sambhogakaya) is said to contain many “transformed (nirmanakaya) Buddhas numbering as many as a million kotis of nayutas multiplied by the number of the sands of the Ganges River”. I have taken a piece of paper and written the key points out so I can go over the different aspects and will also reread both posts again. This is a part of Shin Buddhism I could not even begin to understand a short while ago, but as Amida works with me more I am learning new things all the time. Thank you again, you have been a big help. You are welcomed, Camille. I am glad you found my articles useful. Yes I understand. I think that too often people WANT something to be a certain way and so they go looking to prove it is so. Master Shinran's writings have never given me any doubt as to the validness of Dharmakara, Amida or the Pure Land being real and true. And since being gifted by Amida, there is absolute 'knowing' - which is alot stronger than 'not doubting'. Thank you for explaining. & I really enjoy your site and articles.